The journey from Bumthang to Mongar is one of the most beautiful in the Himalayas crossing 4,000m high Thrumshingla pass. Gushing waterfalls, steep cliffs en route to mongar Bhutanwith even steeper drops, blazing flowers and constantly changing vegetation combine to make this journey as varied as it is beautiful. Mongar marks the beginning of Eastern Bhutan. The second largest town in the sub-tropical east, Mongar like Trashigang further east, is situated on the side of a hill in the contrasts to other towns of Western Bhutan which was built on the valley floor. In the far east of Bhutan, on the bank of Gamri Chhu river lies Trashigang, the country's largest district. Trashigang, once the centre of a busy trade route with Tibet,Ranjung monastery Trashigang Bhutan is today the junction of east-west highway with road connecting to Samdrup Jongkhar and then to the Indian States of Assam. This town is also used as the market place for the semi nomadic people from Merak and Sakteng whose costumes are unique in Bhutan. 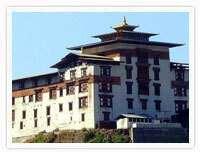 Built in 1659, the Dzong serves as the administrative seat for the district as well as the home of the monk body. The Dzong commands a remarkable view over the surrounding countryside. 24 km from Trashigang, the temple of Gom Kora is set on a small alluvial plateau overlooking the river. Surrounded by rice fields and clumps of banana tress, it looks like an oasis in an arid landscape. It is one of the famous places where Guru Rinpoche meditated in order to subdue a demon who dwelt in a huge black rock. 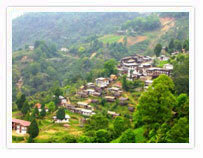 Trashiyangtse is a rapidly growing town and administrative center of the district. Situated in a small river valley, it is a lovely spot from which to take walks in the surrounding countryside. The dzong overlooking the town was built in the late 1990s when the new district was created. Trashiyangtse is famous for its wooden containers and bowls, gom Kora templewhich make inexpensive, attractive and useful mementos of a visit to this remote region. 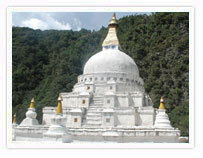 This dazzling white stupa is situated on the riverbank below the town. Constructed in 1740 by Lama Ngawang Loday, it is built in the same style as Bodhnath stupa in Nepal, with eyes painted at the four cardinal points. During the second month of the lunar calendar there is an interesting celebration here, known as 'Kora'. Bomdeling A pleasant walk of about three hours from Chorten Kora, Bomdeling is an annual migration place for black-necked cranes, which fly over from nearby Tibet to pass the winter months in a warmer climate. The road from Trashigang to Samdrup Jongkhar, completed in 1960s, en route Samdrup Jongkhar enables the eastern half of the country to access and benefit from trade with the south as well as across the Indian border. There is little to see in this area, other than the busy market which straddles the border. Samdrup Jongkhar is a convenient exit town for tourists who have arranged to visit the neighboring Indian state of Assam.